With the emergence a few years back of a new My Bloody Valentine album and bands such as Ride and Slowdive seemingly falling over each other to hitch themselves to a shoegaze revivalist bandwagon, Wasuremono seem perfectly placed for when the powers that be coming looking for their slice of the action. The album is actually a compilation of two e.p.s recorded a year apart and whilst there is a clear evolution into a more soundscaped environment over that time, the step seems like a natural progression, a band making itself more comfortable in a familiar environment rather than a conscious change of direction. Falling very much on the dream-pop side of the genre, theirs is more of an ambient drift, a sound that washes over you in shallow waves and often then recedes back into a Cocteau Twins world of fading vapour trails of sound and half heard vocal shapes. William The Conqueror, from the newer side of the album, is not only a one-hit, sound bite of what the band does best, if one is even needed, it is a beautiful song built of intangible threads and sounds that hang like mist in the air. 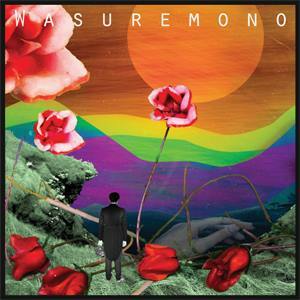 Wasuremono are a band that allows us to forget the bombast and blatancy of the modern age but neither do they advocate a return to purest, Luddite approaches to making music (though the rootsy groove of Dead Man’s Opera might just undermine the argument.) Generally speaking, the have the ability to take all the technology the modern era has to offer but use it to create gossamer layers of music, unique textures that when overlapped create subtle, kaleidoscopic patterns that shimmer but seem to carry no weight. Effects heavy bands often use their technological building blocks to bludgeon the listener, to try and convey the grandeur of the new musical age or possibly soundtrack its destruction. Wasuremono sit somewhere between; sculptors of hypnotic dreamscapes and sonorous bliss in an apolitical age. Ecstasy…but without the clubbing!